This Very Private, Traditional Hawaiian Beachfront Home is a Rare Find!! Completely remodeled 'KNOLL TOP CUSTOM HOME'. Located in Kihei Town (South Maui), a place where the 'SUN ALWAYS SHINES' (almost always~!)!! Kihei is the warmest location in Maui with unsurpassed weather, Best Oceans, Views & the Best Beaches surround this Fabulous Home. This Custom Beachfront Home offers all the amenities you will need for a perfect vacation. If we have missed something, please let us know. Top of the line materials & imported furniture from Bali. Travertine flooring throughout the home, a 20 ft, pocket sliding glass door opens for the most Spectacular 180 degree views of the Blue Maui Ocean & picture perfect views of the outer Islands. 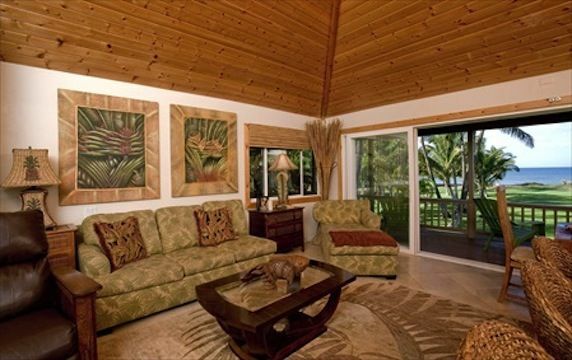 Between Jan. thru April, watch whales from your Private Lanai or Master Bed. Once inside the gate, a short walk to the top of the knoll brings you to this Quiet, Secluded, Beachfront Home! UNSURPASSED BEAUTY!! RARE TROPICAL FIND!!! : All of the linens and towels are of the very finest quality. The master bedroom faces the Ocean & has sliding glass door that opens to large Lanai. It has a King Size Bed. The 2nd bedroom has Oueen Size bed & 3rd bedroom has 2 twin beds & the Great Room has a new Queen size sleeper sofa. This home is located on a Very Private, Gated Road. The home & property are gated, fronted by a Lava Rock Wall, with another Gated Entry into the property. Built in 1937, as a Private Beachfront Home for a Prominent Hawaiian Family, one of the Traditional Hawaiian Beachfront Homes left in Kihei. Inside the gate, a short walk to the top of the knoll brings you to this Perfect Beachfront Traditional HHome.. Very Traditional Hawaiian Home upgraded to Perfection! Come and experience this Rare Find!!! Very PRIVATE Sandy Beach located at the end of lawn area. Small waves, great for children. This property is reminiscent of Old Traditional Hawaii. Palm trees/Tropical Foliage.Private,Tropical,Beautiful! WALK TO GROCERIES, RESTAURANTS, CHURCHES, COFFEE SHOPS, McDonalds, Jack in the Box, local interests, Drs., Drug store, Beach rental stores, ETC: Great location for those who enjoy a short walk to town. Home is located just off the main road in Kihei, So. Kihei Road. Close enough to walk everywhere but you are far enough away to not hear traffic noise. Popular fishing spot for locals, near by. Local buses on main road to take you around to local business. The home is what most guests consider the best location in Maui, do to it's central proximity to all the Maui has to offer. We have always been drawn to Maui, especially Kihei, for it's very slow pace, loving people and weather that is found almost no other place else in Maui. We receive very little rain here, great for sun lovers!! Kihei is a very small town, yet with all of the conveniences of a larger city. Close to Wailea, if Golfing is your pleasure, fast food and retail stores abound. Upscale restaurants are also a few blocks from the house. A community swimming pool is located just 3 blocks away, it has 4 pools, including a toddler pool for your use, 7 days a week. It is free to use..It's a wonderful stop for family fun. We feel our property is very unique in that it is difficult to find a private, quiet home, with all that this property has to offer. Most guests feel as though they are on an island of there own. You will be able to walk or jog, approximately, 6 miles of sandy beach. The large lawn area is actually owned by the State of Maui, but we maintain, water and maintain the lawn and trees, so our long term renters always have a beautiful lawn for playing games and for children to run and play! 180 degree ocean views, outer islands, Maui Mts. Incredible lawn area with safe beach. GREATROOM HAS FULL 180 DEGREE VIEWS OF OCEAN. This is a one of a kind property for the price. There are no other structures located between the house and the Ocean, just a short walk across the lawn to sandy beach No hills to climb down or rocks to climb over. please use you own cell phones! Kenmore washer and dryer in enclosed area on side of home! Beautiful Great Room with 12' tall ceilings lined with prime Knotty Pine wood. 20' sliding glass door, lots of windows. 2 flat screen TV's for your use. Large lawn area between the house and the ocean. (this property is mostly owned by the State of Hawaii) but we maintain the property, water, mow & gardens. It's like having your own Island!!! THE MAIN HOUSE HAS A LARGE COVERED BALCONY WITH TABLE, CHAIRS, SOFA AND BBQ. One of the Original Beachfront Homes in Kihei, built in 1937, sits on a knoll overlooking the Ocean. Completely remodeled with all of the finest materials, but the Traditional Hawaiian Home remains in tack. One Of A Kind Property. The road is Private & Gated, as well as the home and property surrounding the home. Home is located on a dead end road with only 3 other residences. Huge windows & 20ft Pocket sliding glass door that overlooks the Ocean with 180 degree with a large lawn are. a large lawn area. The sandy beach is at the end of the lawn area that you see in the photos. Everything you will need is here, just bring your swimsuit!! PRICELESS!! Very, child friendly, large lawn & gated property make the home a very safe place for your little ones! Person signing the contract must be at least 25 years old. Smoking permitted on Lanai's, Patio, Lawn & Beach areas. An amazing property with lots of outdoor space. Our family aged 3 - 70 had an amazing stay. Lots of outdoor seating for everyone and a yard that resembled a soccer field leading to a private beach. Great location! We would book again. The Perfect Hawaiian Home... a dream! We stayed at this property for 10 days in October and words can't describe how amazing it was. We had a group of 7 friends (good amount for the house!) take on Maui for some much needed R&R. A 30 minute drive from the airport, tucked behind a beautiful wooden gate, sat a fabulous beach front home that screamed, "vacation!" We had a packed schedule of events, hikes, luau's, adventures, etc... but the best part of each day was coming back to this home. Every night we enjoyed pina colada's on the patio and soaked up the sunsets. I made sure that we kept a few afternoons free so we could take advantage of the giant grassy yard! Equipped with lawn chairs, croquet, and abundant sunshine... it was paradise! The home itself was like walking into a Home & Gardens "Hawaii addition" magazine... new appliances (well received by someone who loves to cook), plenty of seating both inside and on the deck, and a tiki hut ceiling that was made even more picturesque by a couple of the gecko's that managed to sneak in. The entire wall facing the ocean is a series of sliding doors that open up to create the ideal indoor/outdoor setting. This small community is walking distance to local shops, restaurants, bars, grocery stores (we preferred Times which is a block away), and the drugstore. Tips: Purchase a pair of water shoes at CostCo or Longs as the beach in front of the house is a little too rocky for galavanting in without a some cushion. Rent a stand up paddle board or kayak from down the street and you're bound to see turtles right out front. Mosquitos came out at night so if you're likely to get bit, keep a bottle of OFF nearby. The studio downstairs is great for a couple or someone who likes a little more privacy. Water noodles are awesome for taking out and lounging in the ocean... with a drink in hand. Take a sunset photo EVERY night! It helps ease the pain when you have to go back home. Enjoy! I was so taken by this property. I had a wonderful opportunity to stay here with 5 friends. Best most memorable experience was the Sunsets - and exceptional views throughout the day. 6 was a good amount of people to stay here, it technically sleeps 10, but I thought six was a great group size. We all had our own space and yet felt cozy gathering together on the lanai or at the dining table. The home is decorated very tastefully with modern Hawaiian style. I loved the nice little touches of art in this home. The landlord gave some tips on having the windows open and also avoiding the critters that come 'round. I am glad we had those little tidbits to avoid some insects. The kitchen and fridge were very accommodating; they even added a new coffee grinder. The fridge dispensed ice and water ---- not miraculous, but I don't have that at home. It was a fancy home, but also very down to earth. I stayed downstairs in the studio and it suited me just fine. At night when I would retire to my quarters, I could have used a nightlight of some sort, it did get dark and I couldn't see. Also, you can do your laundry here, not that I want to do domestic chores while on vacation, it was a nice amenity. I liked the access to the beach, it was very peaceful in the morning and quite stunning to be able to stroll out onto the beach; with ease. We walked to the market, dive shop, and sports bar a couple of times. So, very convenient. The entrance is very private which made us feel confident and safe while in a new city. I cannot wait to come back. Positive: The unobstructed view of the ocean is breathtaking. Our family spent the mornings/evenings sitting on the large deck watching/listening to the ocean. There was plenty of room for our family of six and the studio was perfect for my son who needs his own space. I loved the large hammock out back. It was a great place to stretch out and nap. The side deck was a perfect spot for our massages. We had Marty from Relax Therapeutic Massage come out and all six of us got massages. He was fabulous! After five hours of massaging the rest of the family, he still had enough strength for me. The house is located where you feel like you are away from it all, but close enough to a grocery store and other great places that you can walk to. The Maui Dive shop is right across the street. We got our snorkeling equipment there and snorkeled out back. We saw a lot of fish and got the hang of snorkeling before we went on our “snuba” excursion. Negative: There were some minor issues with the house as mentioned in two other reviews, the biggest issue being that the top rack of the dishwasher was broken and the soap dispenser didn't open so we did our dishes by hand. SUGGESTION: if there is something out of order when you get there, let Mitzi know right away. The kitchen faucet would not turn when we got there, but we dealt with it because it was just a minor inconvenience. When we checked out, I left a note for the cleaners that it needed to be fixed (along with the other items we found) and, consequently, we were blamed for breaking it. Also, leave the window by the couch closed. We had that window open and a very strong wind came up and blew the shutter, which knocked over the lamp, breaking the shade and the part that the bulb screws into. We alerted Mitzi of this and she said no problem. She knew how strong the wind could get. When the contractor came after we left, he said it was due to “customer misuse”. How he could determine what happened just by looking at it, I don’t know. This was very upsetting since we told Mitzi what happened. We had offered to have it repaired, but were told not to worry about it. We were charged anyway. All in all, it was a nice place to stay. If we stay there again, we just know to alert Mitzi as soon as we get there if there is something wrong. As vacation rental property owners ourselves, we appreciate when guests let us know if something needs repair since we cannot always be there. Mahalo and thank you so much for your very nice review of our home. We appreciate you sharing your thoughts and remarks of improvements that can be made. Unfortunately, we never know if something is going to break, or when. We only know when the housekeepers see something or a guests lets me know if there is an issue when they arrive. I never received any correspondence while you were there, that there were any problems at all. I can't offer help, if I don't know. When guests overload the dishwasher, it's going to break. Regarding the breakage of the $600.00 lamp, that you mention that the wind blew over. That lamp has been in the same place for 5 years and has never blown over. The bottom line here is that if something breaks during a visit to another persons house, yes, you should be responsible for repair or replacement. That is clearly stated in the contract. Just for the record, your full deposit was returned, in 2 separate checks. Our wish for you and your family is one that you will remember the wonderful times you enjoyed in our home, and not so much minute issues. This was an amazing trip for us! Sitting on the Lanais enjoying morning coffee. Sitting on the Lanais watching birds, palms, swimmers and paddle boarders. Sitting on the Lanais while enjoying tropical drinks and beautiful sunsets! Cant beat the view and the house was perfect! Mitzi is very accommodating and made everything very easy for our arrival. Super convenient location. Thanks for sharing this wonderful piece of paradise Mitzi! This home is everything that the website says it is. It is a great location right on the water with every amenity imaginable. Mitzi was very accommodating and answered my emails quickly. I would recommend this property with out reservation. Our group of ten spanned three generations and everyone was delighted. Couldn't have asked for more. Thank you so much for the wonderful review! We couldn't be happiest to know that our home met your expectations for a wonderful vacation. Thank you for taking the time to share your experience with us and our potential guests. Our potential guests truly appreciate a review that comes from someone who has stayed at the home. We look forward to sharing our home again, with you and all of your family members. A RARE FIND!!!! Traditional Hawaiian Home, BUILT IN 1945, LEGAL GRANDFATHERED VACATION RENTAL,sits up on a knoll over looking the Ocean. Located on a quiet, GATED PRIVATE ROAD. PROPERTY ITSELF IS GATED & enclosed by a Hand Built LAVA ROCK WALL. Very PRIVATE Sandy Beach located at the end of lawn area that you see in photos. Small waves, great for children. This property is reminiscent of Old Traditional Hawaii. Lots of Palm trees and Tropical Foliage. Very Private Tropical Setting, BEAUTIFULLY REMODELED, WITH TOP OF THE LINE CONSTRUCTION AND new beds, sofa and many imported pieces from Bali. EXTREMELY QUIET AND PRIVATE!! But best of all it is just 1 block from all shopping, Fine Restaurants, Fast Food, Post Office, Coffee Shops Drug Stores, Kaiser Medical Center, just about everything! If you are looking for a One Of A Kind, Hawaiian Home and property, this is it! While remodeling, we have maintained the original feel of the Traditional Hawaiian Foliage, including Mangos, Plumeria, Palm Trees etc. Rates are subject to change until reservation is confirmed and 1st payment received.